Feel the Love, Eat the Fish: Patsy's Restaurant in Bethany Beach, Del. Patsy’s Restaurant used to be the new kid on the block, then one day it was part of the establishment. When her mom, Patsy, opened the now-iconic Bethany Beach restaurant Robin Rankin took up running the front of the house, hostessing, waiting tables, whatever was needed to help get the family restaurant on its feet. Before too long, though, she made her way back into the kitchen. After all, the mother/daughter team each had attended L’academie de Cuisine in Bethesda to help them each elevate their cooking skills. Patsy’s focus had been in bread and pastries when the family lived in Washington D.C. and she brought those sensibilities to bear when she opened her eponymous restaurant, which started with more of a sandwich shop vibe. By the time Robin moved into the kitchen in 2005 Patsy’s Restaurant in Bethany Beach was transitioning to more of a casual/fine dining place. 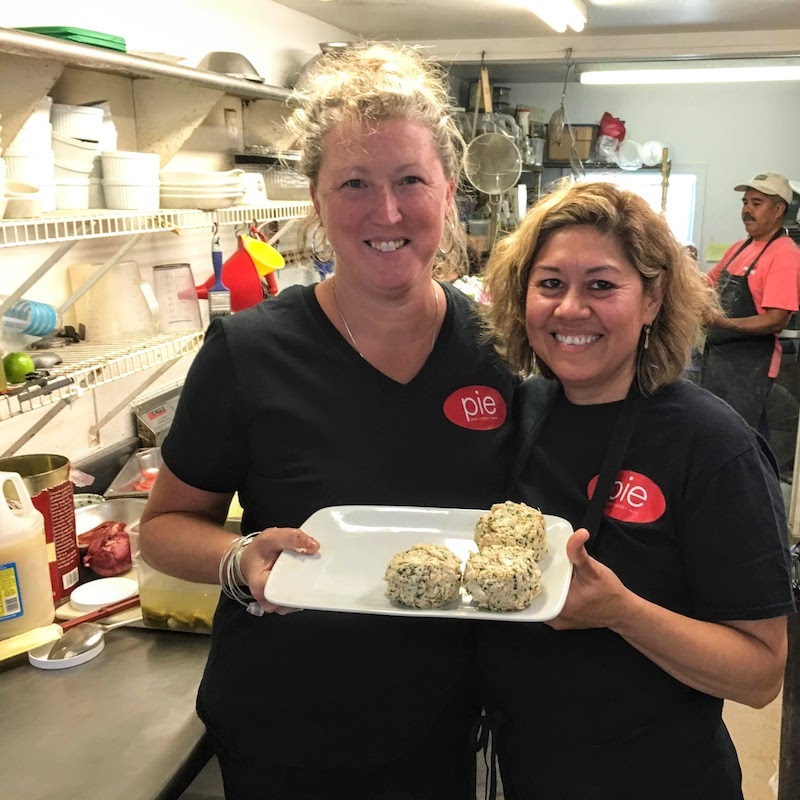 Patsy’s served crab cakes that visitors and locals alike based their summer dining menu upon, and as their menu grew in complexity and scope, they dropped lunch and the lunch menu altogether to focus on their dinner craft. Patsy’s Restaurant chef Robin Rankin talks about learning her mother’s crab cake recipe and process. Patsy still was preparing the crab cakes at the time, a duty she only recently ceded to her daughter and staff. She was really proud of how well they were received and, in turn, how the whole dining experience was elevated by their success. The entire process is about putting the food first, which is the best way to put the diner first. Not only were both Robin and Patsy committed to making the best food and most intriguing menu they could, but they had a similar perspective on what that meant. The jumping off point wasn’t just making their crab cakes great, but making them great consistently. People return to Bethany Beach annually with the taste for a crab cake from Patsy’s in their mouths. They are never disappointed because the first crab cake they loved tastes just like the most recent crab cake they’ve had. There’s a comfort in telling people where to get the best crab cake and knowing that it wasn’t accidental success. Patsy’s is dependable. Robin Rankin and Cody Parsons, who has been at Patsy’s Restaurant for 18 years. 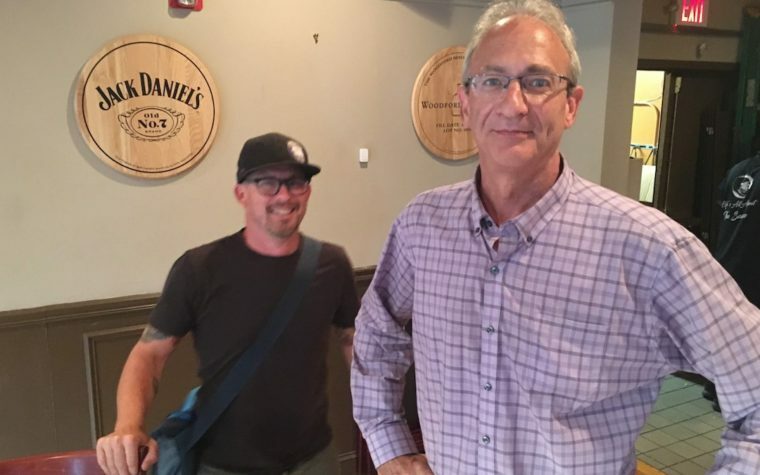 In 2014, Robin opened PIE in Bethany Beach with Daniel Lewis. Running two restaurants in the summer is challenging to say the least, but having people you can trust helps reduce the insanity, she said. Cody Parsons has been at Patsy’s Restaurant pretty much from the start, so not only is she familiar and comfortable with the operations, she knows why things are done the way they are. Parsons is just one of the many long-term employees at Patsy’s that keep it running well enough for Robin to survive working at two places, even as Patsy begins to relinquish her responsibilities. The larger point is that a part of making great food is drilling the process into the team. 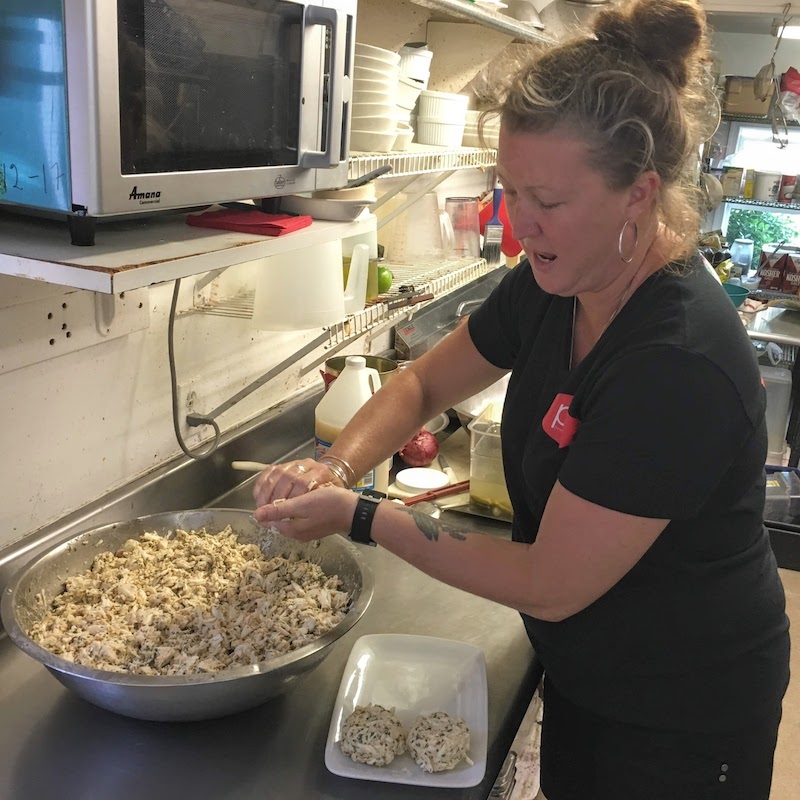 A decade ago, no one could make the crab cakes to her satisfaction, but today, the recipe as well as the process is part of Patsy’s Restaurant rather than just something of which only Patsy is capable. It’s a lot of pressure, but also a welcome responsibility for Robin and the staff alike. 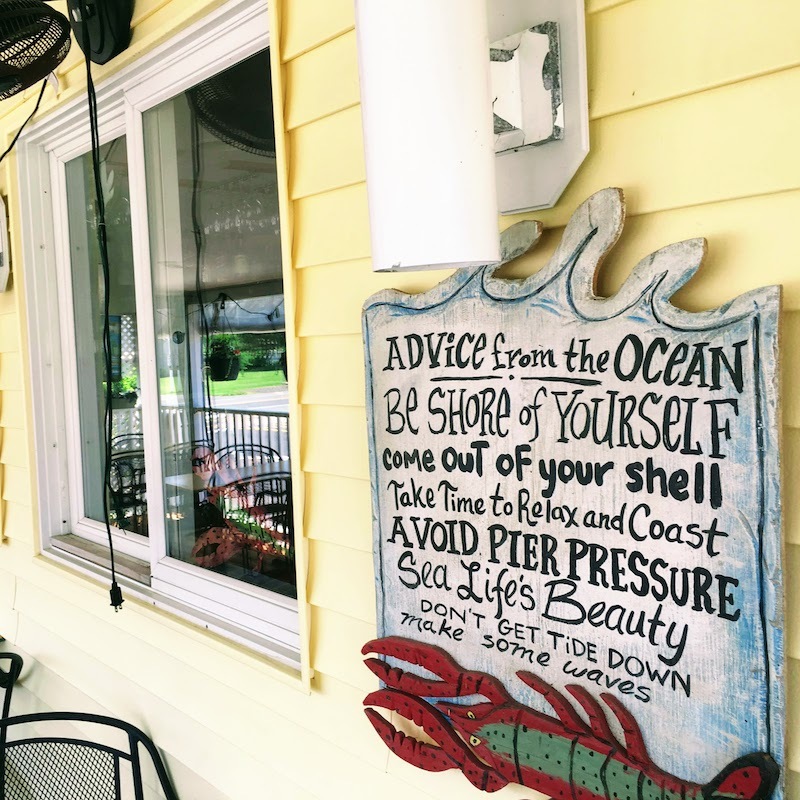 This sign on the outside deck at Patsy’s Restaurant in Bethany Beach sets the casual tone for the restaurant, making the casual gourmet that much more surprising. Patsy’s is know for it’s crab cakes by many, Patsy’s isn’t a crab cake restaurant. That is, both she and Robin work hard to make a diverse fine dining menu that is worthy of a patron’s time even if they are not crab cake enthusiasts. It always has been a point of pride for Robin to make excellent menu choices and ask the guests to take a chance. 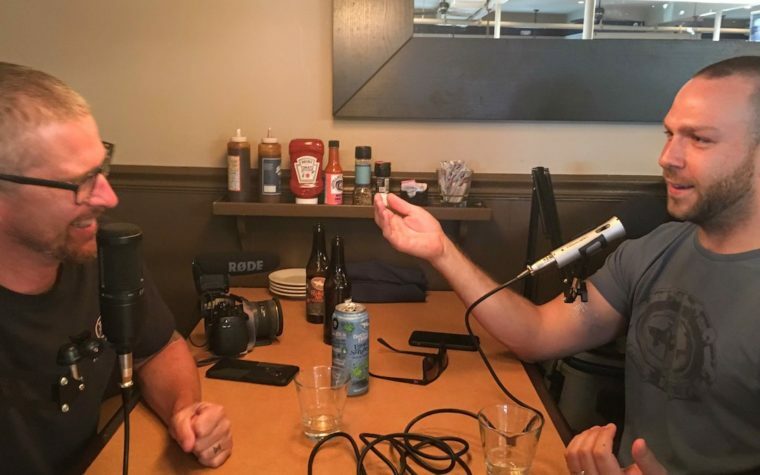 Robin talked about how long it took to get bluefish to be a menu hit. It’s not a fish that people associate with fine dining often. It’s traditionally “fishy” and a little fatty but Robin loves to make it in what could be called a Mediterranean style using spices most fish aren’t bold enough to support. Similarly, she loves serving the whole fried snapper.